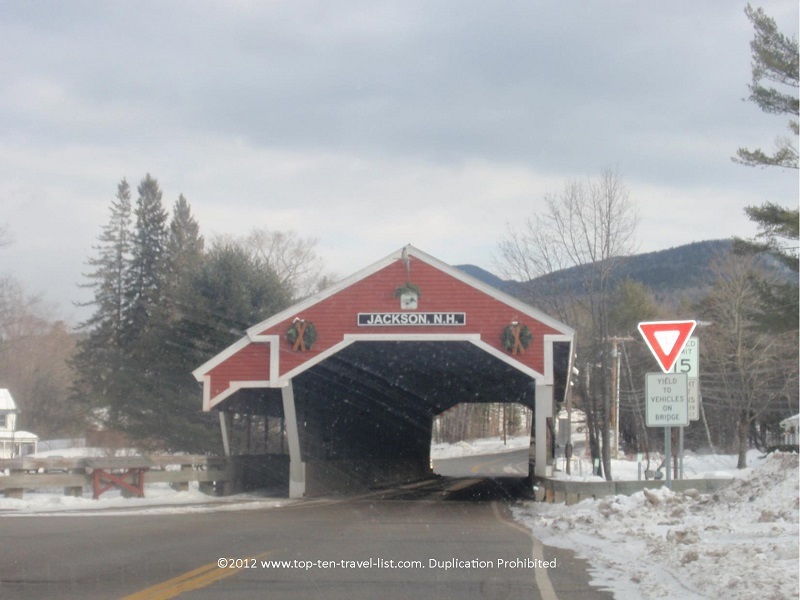 Attraction of the Week: Nestlenook Farm in Jackson, New Hampshire - Top Ten Travel Blog | Our experiences traveling throughout the US. Picture yourself in a winter wonderland complete with a Victorian Ice Rink, beautiful snow capped mountains, horse drawn sleigh rides, and plenty of scenic trails for snowshoeing. 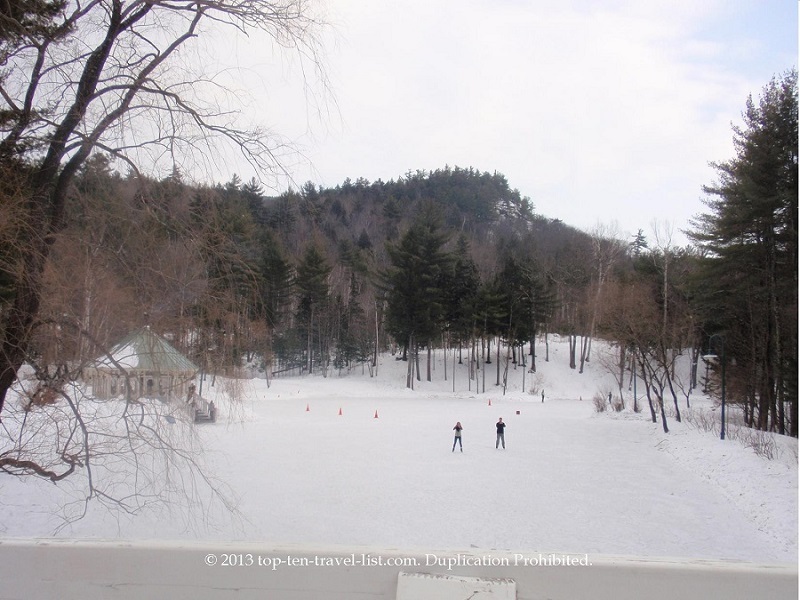 At Nestlenook Farm, a 65 acre resort located in beautiful Jackson, New Hampshire, you can take a step back in time and enjoy all of these festive winter activities in a perfect small town mountain setting. Imagine yourself skating in this winter wonderland along to festive chime music as you watch a horse drawn sleigh travel around the beautiful grounds. After your skating session, relax with a cozy break in front of an outdoor fire pit with a warm mug of hot cocoa. The 3 acre Victorian rink is right out of a snowglobe. If your visit happens to fall on a snowy day, you will feel as if you are trapped inside a beautiful Christmas snowglobe. The setting is quaint, old fashioned, and picturesque. It’s the perfect addition to your holiday festivities. Taking a sleigh ride is a must. The seats are heated which makes the ride all the more cozy. While waiting for your ride, you can cozy up in the gazebo by the fireplace with a hot drink. 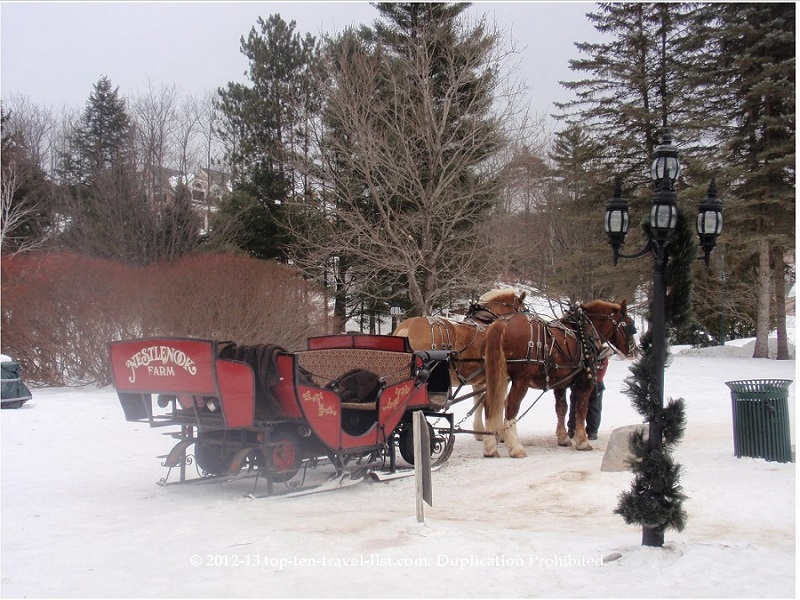 Your sleigh ride will take you around the beautiful White Mountains of New Hampshire. A special winter romance package including a glass of champagne, a fur blanket, and a private seat in the back of the sleigh is the perfect winter date idea! A few other specialty packages are available including a popular Jingle Bell Chocolate Tour where you will take a sleigh ride over to several different locations in Jackson Village for delicious local chocolates! If you are looking for a bit more action, look no further than the resort’s large trail system, perfect for snowshoeing adventures. Beginner to advanced terrain is available to suit every skill level. 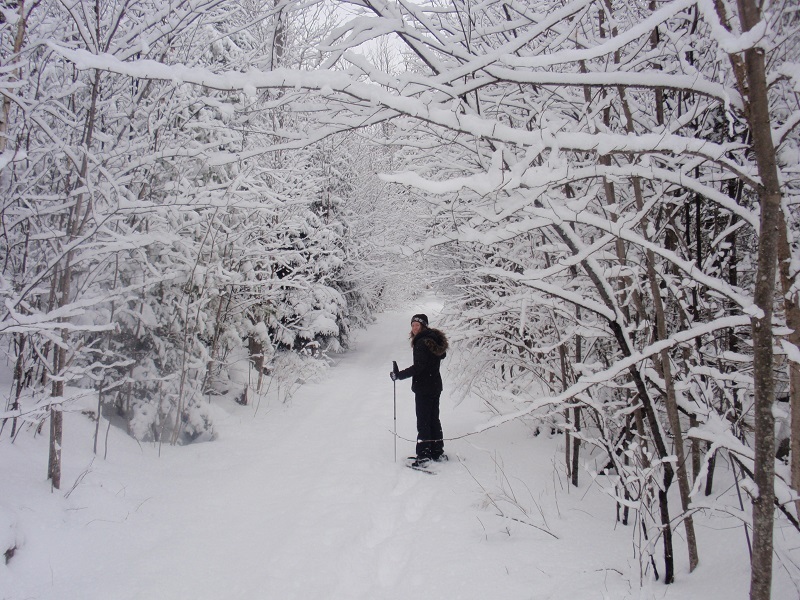 Snowshoeing is such a fun winter activity. It is still a great workout, but much more affordable and safer than skiing. It’s a great option for those who prefer not to ski, but still want to engage in an exciting winter activity. Snowshoe rentals are available or you can bring your own. I highly recommend a day out at Nestlenook Farm to anyone visiting the Jackson, New Hampshire area. No matter where you are staying, the drive over to Nestlenook is more than worth the journey. For more convenience you can stay right on site at 2 different on site properties: Victorian Village and Grand Victorian. 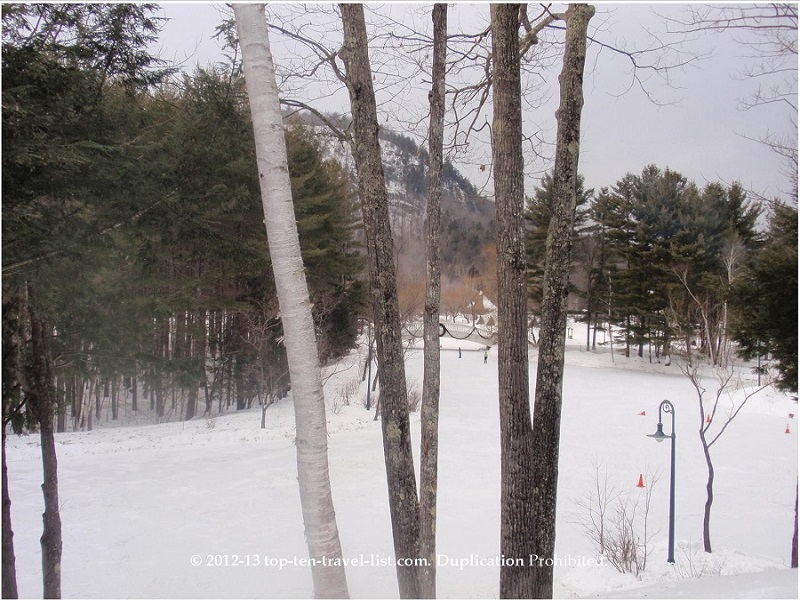 Both offer a relaxing setting and convenient access to all the wonderful winter amenities. If you plan on participating in all 3 activities or a combination of 2 (sleigh ride, ice skating, and snowshoeing), it is a better deal to purchase a special package rather than buying all 3 separately. A sample package which 1 hour of skating, an hour of snowshoeing, and a sleigh costs $41.50 per adult and $35.50 per child. This is a pretty good deal as it includes both skate and snowshoe rentals. For this year’s schedule and a full price list, visit the Nestlenook Farm website. Have you ever visited Nestlenook Farms? Share your experience!